Hold on tightly, we’re taking you back in time! The photo above is of the New York showrooms of Harry Northwood’s agent, Frank Miller – and it was taken 108 years ago, in August 1911. We have posted a much bigger version of the image on a separate page, so that you can see it larger and more clearly. Click on the picture on the right, or follow this link: Frank Miller's Showroom. 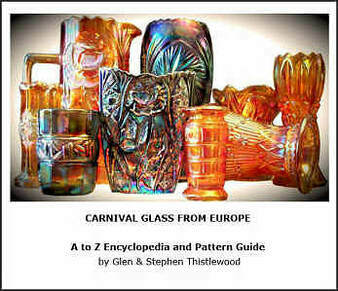 It's possible to recognise many shapes and patterns of what is clearly a treasure trove of Carnival Glass – it is described in the accompanying text as “a comprehensive line of iridescent ware”. So, what can you spot? ​There are many other recognisable shapes, including Singing Birds items as well as Acorn Burrs table sets. And can you spot the white tin liners of the Grape and Cable ferneries in the middle distance? 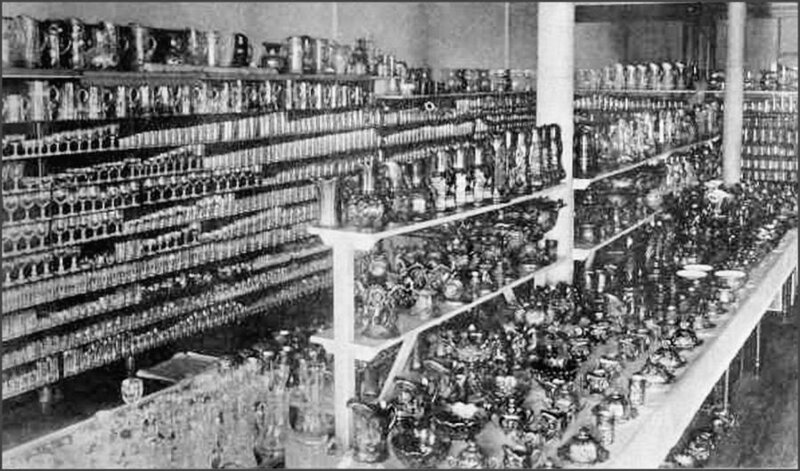 And then just look at those high-up shelves around the walls – even more pitchers, some appear to be enamelled. We think we can see the lilies of epergnes just in front of the distant supporting pillar. What else can you spot? 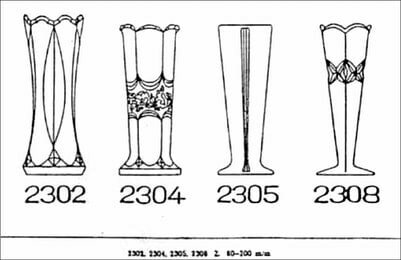 Carnival Glass researcher, John Hodgson, has surprised us again with an intriguing tale of a tantalising little vase he discovered recently. A diminutive beauty – standing just 4.5 inches high – this vase was challenging to identify. But as John explained, he rolled up his sleeves and began digging around. His story is a fascinating one, with twists and turns along the way – but John’s persistence paid off, and ultimately, he identified and attributed the delightful little vase. ​You can read the full story, and discover so much more as you follow the trail with John. We’ll give you a clue about the vase with this image below … guess which one it could possibly be? Our Network Facebook Group has a very enthusiastic and extremely energetic membership, and with that comes an enormous amount of information every day. ​Members post questions, answer puzzles and mysteries, and frequently show very unusual pieces. Three fascinating surprises were recently revealed in the Group – and all three (coincidentally) are Contemporary Imperial Carnival. Early in March we were thrilled to see this unusual Starfire bowl in Horizon Blue, shown by Louise Lethbridge. 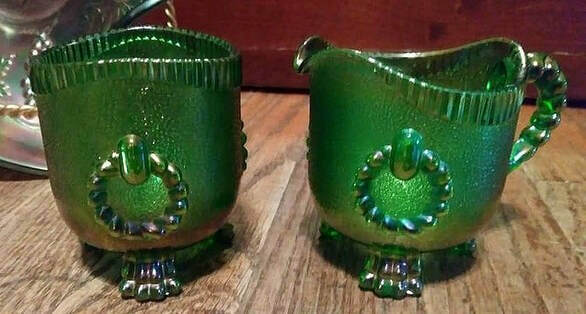 Made by Lenox Imperial Glass in 1979-80, these were produced as a Limited Edition. 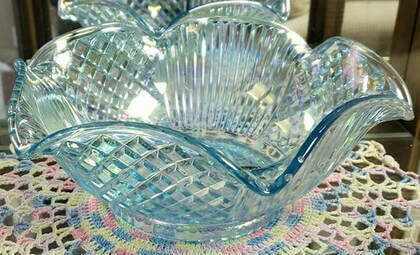 You can see more photos and information on our Imperial homepage: Imperial Carnival Glass. Starfire bowl in Horizon Blue., courtesy Louise Lethbridge. In mid-March, our Facebook Group was treated to an amazing celebration of green Carnival Glass patterns and shapes, for St. Patrick’s Day. It was mind-blowing! Pieces we’ve never seen before, patterns in all shapes and sizes, and some of the most glorious Carnival you’ve ever set eyes on. Amongst them all was this fascinating Lions Foot creamer and sugar, posted by Crystal Sheets. ​We began to investigate these unusual and very beautiful items, and what we discovered both surprised and thrilled us. From it we learned the story of Imperial Glass, and especially its closure and the subsequent establishment of the “Save Imperial Committee” in 1984. Fast forward a year or so, and guess what was being sold under the aegis of this title? Yes, you guessed … this Lions Foot sugar and creamer (also known as 3-Toed). But, astonishingly, our research revealed even more fascinating details … and this time we found we were turning the clock backwards, to England in the 1880s. ​Lions Foot courtesy Crystal Sheets. ​See the amazing details of the trademarks on these items in Crystal Sheets' excellent photos. And read the full “Story Behind The Glass” to discover the secrets of this fascinating pattern. Here’s the link: The Story Behind The Glass​. The third surprise occurred when Martin Chaffee posted this delicious puff box and cover in our Carnival Network Facebook Group. It completely stumped us to begin with, and as the story emerged, we became enthralled. Have you ever seen this delightful item before? Here’s the clue … Martin told us that it is trademarked ALIG. Four Leaf Powder Box, courtesy Martin Chaffee. On February 17th, in 1914, a steamer sank amongst floating ice, on the Ohio river near Louisville, Kentucky. ​Amazingly, all two hundred on board were saved, despite initial panic and mayhem, as the boat began to sink and no lives were lost in the disaster. However, the fate of one thousand dollars’ worth of Imperial Glass that was on board was a different matter! It all went to the bottom of the Ohio River. We can only guess how many pieces of Imperial's Carnival Glass, may have disappeared into the river! 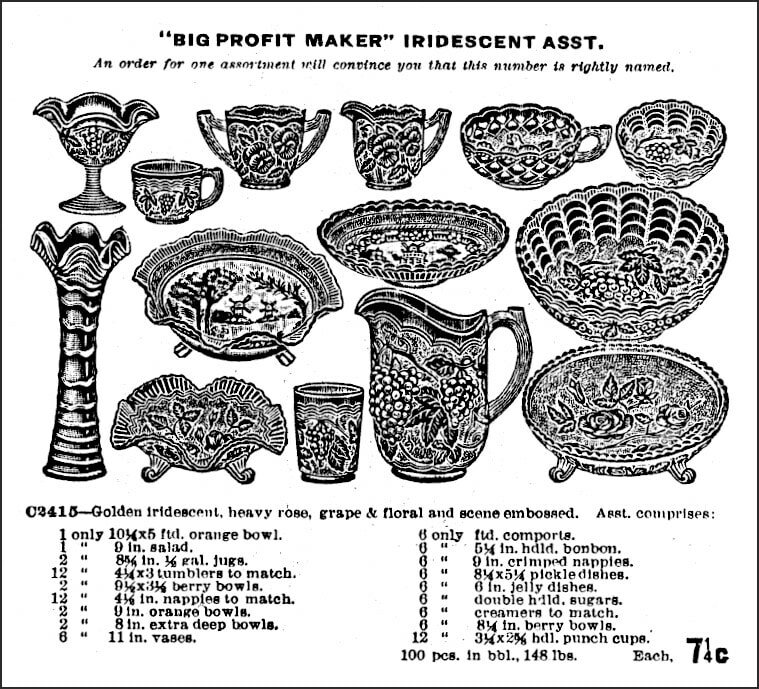 An average price for a barrel packed full of Carnival was around $5 to $7 (Imperial’s 1915 catalogue showed 10 dozen Ripple vases would be packed in a barrel at 50 cents a dozen - the Butler Bros 1915 ad shown below features mixed assortments packed 100 pieces to a barrel at 7¼ cents apiece). ​A thousand dollars’ worth of glass would have been a lot of barrels - at wholesale prices that's over 140 barrels of glass (or more) at the bottom of the Ohio River. Above: A Butler Brothers wholesale ad for Imperial Carnival, 1915. Right: How many Imperial pieces like this Double Dutch bowl and these Ripple vases languish at the bottom of the Ohio River? ​We can only guess how many pieces of Imperial's Carnival Glass, like the ones shown below may have disappeared into the river! ​Our Facebook Group, Carnival Glass NetworK, is booming – growing larger and more active every day. We now have almost 8,500 members in the Group – the activity and involvement are both thriving and energetic, and always packed full of information. Our Group covers all aspects and all kinds of Carnival Glass from all eras and all producers around the world. In the last month alone, Carnival enthusiasts worldwide have made over fifty thousand posts, comments and contributions to the Group. Membership is truly worldwide and activity is literally 24/7. Members post amazing photos, stories, and fascinating insights – others ask for identification and help and always receive maximum support. Discussions and questions pertaining to Carnival are insightful and thought-provoking. We all learn from each other on a daily basis. Involvement has grown phenomenally. Here is a recent post. It says it all: "this is the most friendly, most helpful, most informative, most educational, best maintained FB Group I have ever joined." It's all due to, and thanks to, our brilliant Group members. We are a private (“closed”) Group, which means that the posts, photos and comments can only be seen by other members of the Group, safeguarding privacy. If you are not already a member, do come along and join us, here: Carnival Glass Facebook Group.